My name is Emmanuel Sanchez, but all of my students call me Manny. I am a musician and music teacher and have lived in Southern California my entire life. I started playing the Violin when I was 5 years old at Stevenson Elementary in Long Beach, CA. When I moved to Oceanside in San Diego County, I decided to switch to the Viola after 3 solid years on the Violin. In High School, I decided to play in the jazz band and I again switched but this time to the Electric Bass Guitar. I formed a rock band with my brothers during my Junior year in High School and when the need for an Electric Guitarist arose, I answered and learned to play the Guitar. 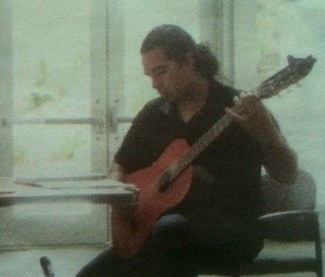 Shortly after graduating I decided to enroll in school and formally study the guitar. That's also when I learned to play the piano and a host of other string instruments closely related to the guitar such as the banjo, ukulele, and mandolin. I have been fortunate enough to study under several master musicians while I studied and obtained my AA Degree in Creative and Applied Arts at Mira Costa College including Eric Foster (University of San Diego), Matt Falker (University of Southern California), and Dr. William Cratty (University of California San Diego). I currently study at San Diego State University under the guidance of acclaimed guitarist and Professor Robert Wetzel, where I intend to complete my California Teaching Credential alongside a Bachelor's of Music in Music Education. As a performer, you might run into me playing guitar for numerous local outfits as I like to keep busy with my musician buddies. I am currently working on an original music project that will be competed in the near future. I have also performed with local acts such as S.M Familia, The Summer Brooke Band, Measure of Hope, The Joshua Struggle, Mira Costa College's Frequency Vocal Jazz, Bobby Mueller, and several others. There is no feeling like performing in your hometown for family and friends and I try to do it as much as I can. As a teacher, I've been fortunate enough to have the opportunity to teach over 150 students in the last 5 years. Beginning in the field of Special Education as Behavior Management Instructor, I quickly learned that I had a passion for teaching. I've since fused that experience with my passion for teaching and began teaching music to students with special needs and developmental disabilities. I feel that this experience has equipped me to serve all of my students with or without special needs as I have learned how to approach and introduce difficult concepts in simple ways. I have also had the opportunity to teach the guitar program at Vista Unified School District, conduct several workshops on guitar playing, and serve on the board of directors of the California Association of Professional Music Teacher's (CAPMT). I look forward to a life of teaching, learning, music, and fun. Below are the lessons openings for Emmanuel Sanchez. Please find a time below and click the "register" button to sign up for a class.